April marks the 45th anniversary of Earth Month. Why not celebrate by renewing your commitment to green living? Starting a vegetable and herb garden is an eco-friendly practice that benefits your health as well as that of the planet. There are a surprising number of items that can be successfully grown indoors. If you have kids, enlist their help in this fun and educational activity. Your family will enjoy having a ready supply of fresh, tasty produce. This "rabbit food" is chock-full of vitamins and nutrients including carotenoids that promote eye health. Plant the seeds in a deep, wide container filled with humus-rich potting soil. 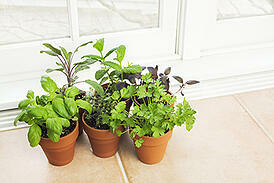 Place the container in an area with plenty of sunshine and keep the soil damp. They're ready for harvest once they've grown to about 3/4" across the top. This versatile vegetable is a delicious ingredient in everything from soups to casseroles as well as a source of fiber and antioxidants. Complete mushroom growing kits can be purchased online through Amazon.com and organic gardening websites. Prepare fresh salads anytime using your own spinach, romaine or red leaf lettuce. Get some seeds or starter plants from a nursery and plant them in a box with adequate drainage. Water regularly, removing all but the largest and healthiest shoots. When harvesting, pull off the outer leaves so the plant can continue to grow. Tomatoes are delicious raw or cooked and have valuable anti-inflammatory properties. Maintain a continuous supply by starting a new plant every two weeks. When they reach the point of being firm but slightly pliable to the touch, they're ready to eat. This herb makes a particularly good complement to your fresh tomatoes and it's a popular ingredient in Italian dishes. It grows best with lots of sunshine and warm temperatures. Prune the plant as it gets bushier, pinching off any flowers that appear. Be careful not to remove all the leaves from any one plant. Chives are a tasty accent to a variety of foods. Plant the seeds in container six to eight inches in diameter and keep it in a partially shaded area, making sure that the soil is always damp. Mint has a distinct, pleasant flavor and scent and it's good for digestion. Plant seeds or starters in a large pot at least 10 inches in diameter, giving them plenty of room to sprawl. Make sure they have a good supply of sunshine and water. Gardening is a relaxing and productive hobby that's well-suited to your Springs Apartments home. You may be surprised by how quickly you develop a green thumb! Share your favorite gardening tips in the comments.